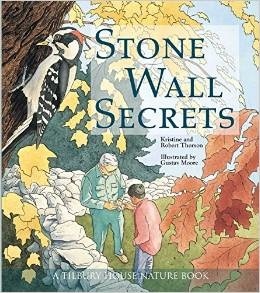 In 1998, Kristine and Robert Thorson published their award-winning illustrated children’s book Stone Wall Secrets (Illustrated by Gustav Moore). Published by Tilbury House of Gardiner (now Thomastown), Maine, this book was re-issued as a Tilbury House Nature Book). 1998 – Smithsonian Notable Book for Children. Professor Thorson does occasional classroom visits and workshops to facilitate the use of Stone Wall Secrets in the classroom. There is also a curriculum for teacher use, a Teachers Reference, a Teaching Kit and a teacher’s guide as well. 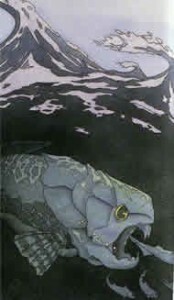 Painting from ‘Stone Wall Secrets’ by Gustav Moore. An ancient placoderm fish that used to swim in the seas above present-day New England.